So when I see gadgets on the shelves at Bed Bath & Beyond or Target - or on TV, I think something like this . . .
"Good idea! But I don't need that. I can do it by myself"
And I have this friend. Amazon Prime has her credit card and address memorized. The things that girl buys . . .
the numbers rank right up there with the junk I bring home. I have a house full of junk. She has a house full of gadgets. She has taught me the value of the gadget. through a small hallway and make a sharp left turn through a small doorway, I said . . .
And they worked. Like a charm. Let me back up for a minute and tell you bit about the gadgets. The Forearm Forklift - we've been using this to move both awkward and heavy things for a while now. 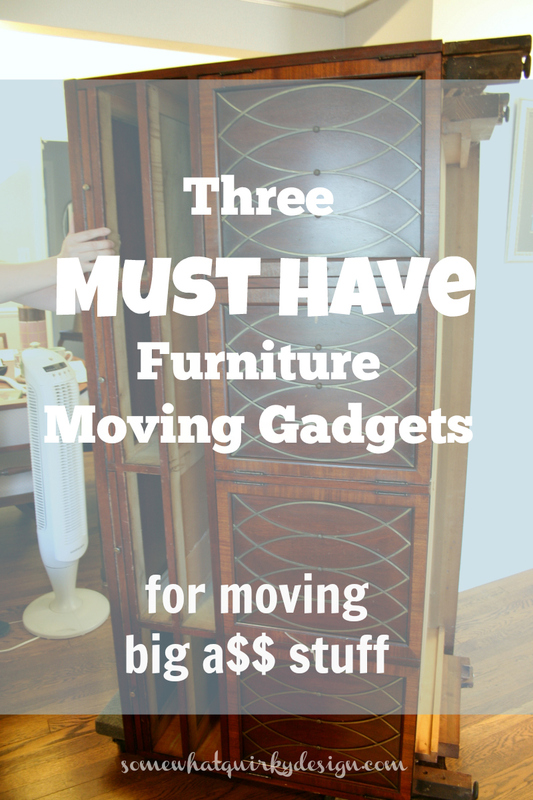 They are really great to move things that are difficult to get or keep a grip on, like couches, large sheets of MDF, and refrigerators. You would be amazed how much more strength there is in your forearms than there is in your hands. Especially when you're no spring chicken. Oh, and the leverage you create actually make the item feel lighter and easier to carry. True story - I had another friend who dropped something giant (I can't remember what it was) on her foot because her hands failed her. Her foot was crushed and she had to have surgery and wear a boot for like forever. ez moves Furniture Lifter - This was a new purchase. A gadget she had seen on TV. She found it at Bed Bath & Beyond. It was purchased just for the particular piece of furniture we were moving. But it is going to be valuable to have access to. It claims to help you lift 10 times beyond your normal strength. It works like a lever and fulcrum and helps you get under things that are difficult to get your hands under, and of course, things that are very heavy. It works so well you could actually just use it for spring cleaning to sweep or vacuum under things. The kit includes ez glide pads that you slip under the corners of the furniture to make it slide across carpet or hard surface floors. It also comes in a larger size - the ez moves POWER MAXX Furniture Lifter. It is bigger and longer and provides lifting capability of 14 times your normal strength. The wheel is the fulcrum. 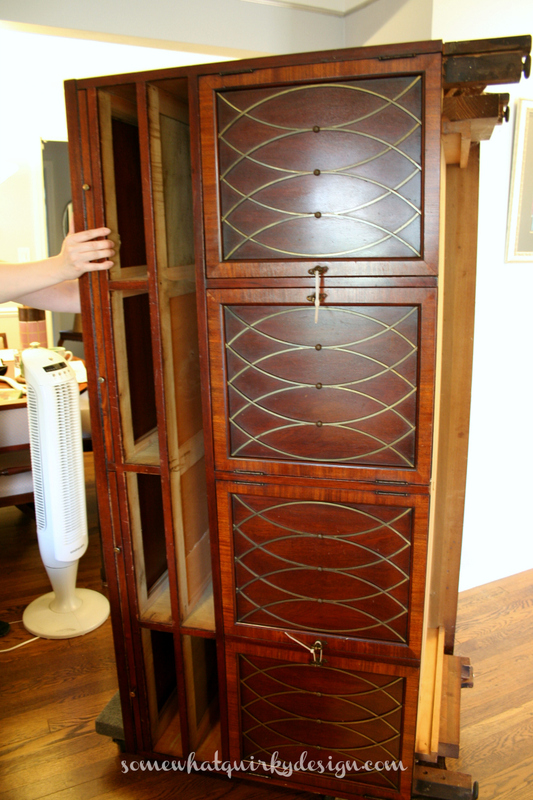 The farther back it goes on the lever, the higher you can lift the furniture. Please ignore the big hunk of cat hair and dust. 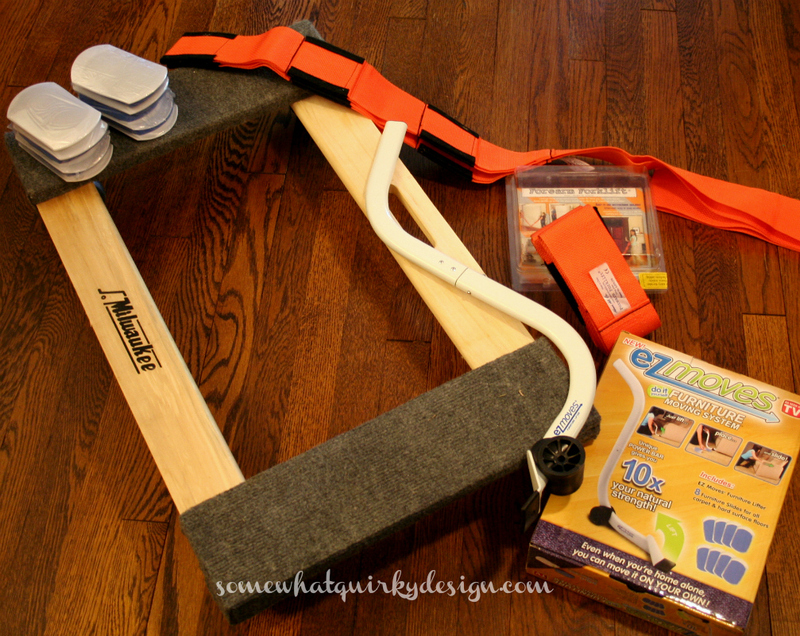 Milwaukee furniture dolly - I guess you could DIY one of these, but this version only costs $20 at Home Depot. Wheels aren't cheap so unless you have some rotating casters that support 1000 pounds hanging around I would just buy one. 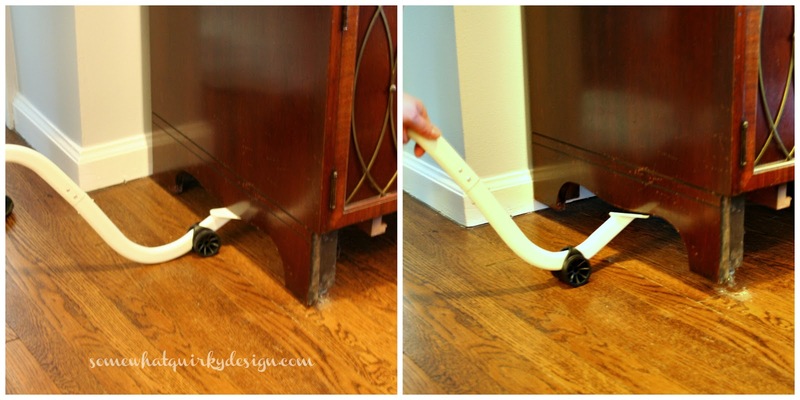 This is great for protecting your floors. Depending on your furniture, you may have to add some 2x6 pieces to adapt the size of the dolly. We first tried it this way. It was a dumb way. 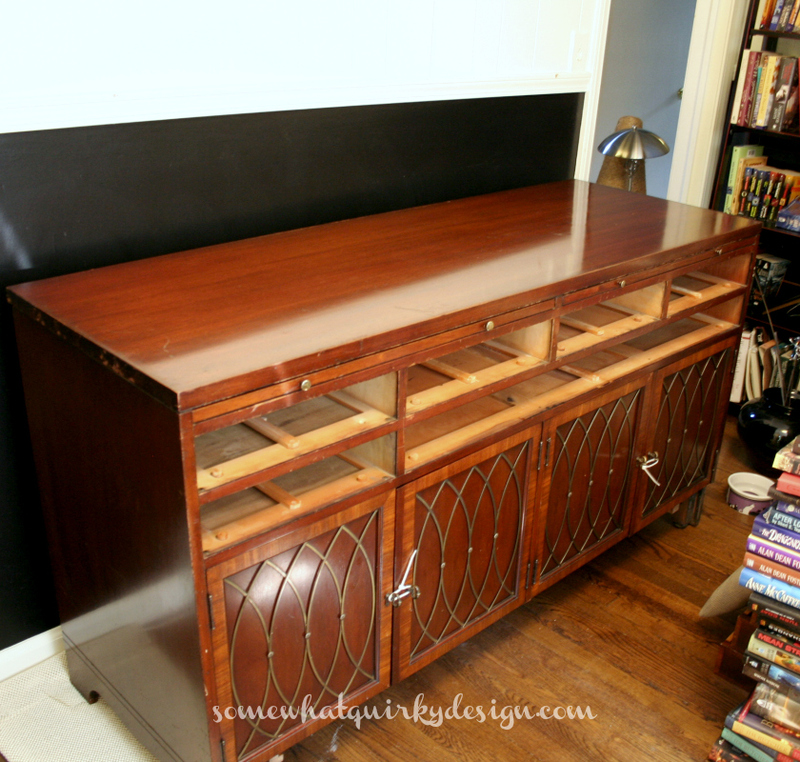 If we were just moving the sideboard across the room this way would be fine, but it didn't work here because of the small area we had to go through. 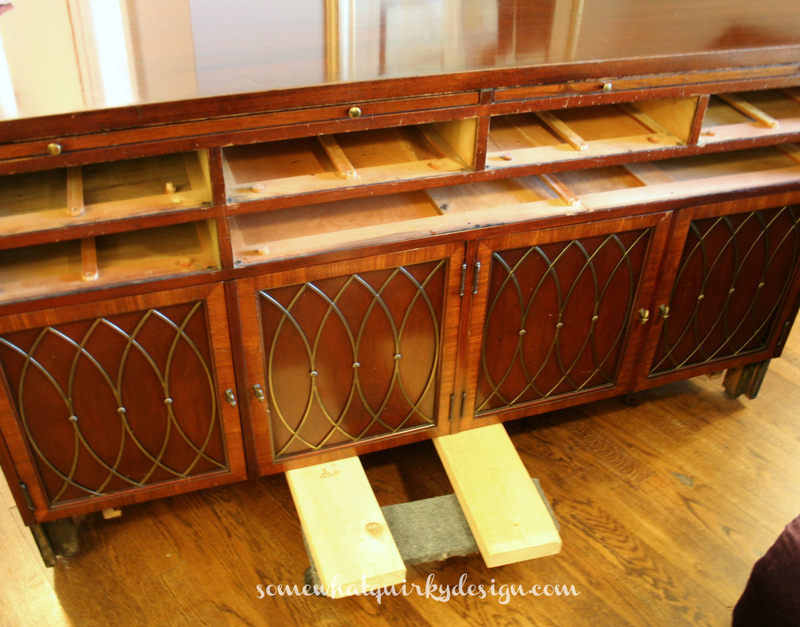 So we had to turn the sideboard onto its side. I wish I had a picture of how we got this up here. But I do not. We put a non-skid carpet pad under one end of the sideboard. Then we placed it very close to the dolly and lifted up the far end until the side tilted over the dolly. The dolly must be weighted or held down so that it doesn't get propelled across the room. It turned out to be much easier than we thought possible. Then all that was left to do was roll it down the hallway, make a sharp left turn, roll it trough small doorway, and set it down (the opposite of how we lifted it). Two chicks moved this seemingly 300 pound piece of furniture with barely a sweat. Well maybe a bit more than barely - note the fan we had to set up. But it's done. And everybody is happy. All three of these pieces get two thumbs up from us. I'm going to go buy my own furniture dolly for sure. I'll probably keep borrowing the Furniture Lift for a bit before I break down and buy it. Even though we didn't use the Forearm Forklifts for this move, they are definitely worth the money. And we will have to use them the next time this piece moves. 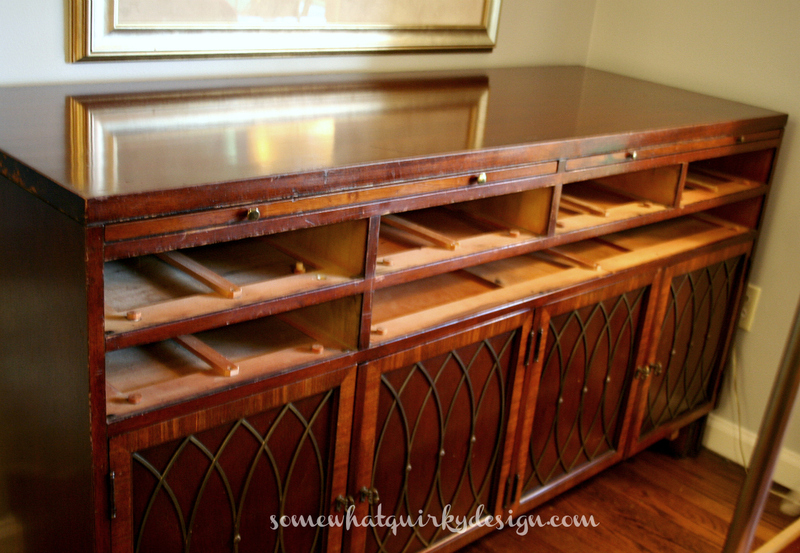 Because very soon this sideboard is moving to my house! That will probably make us sweat more. P.S. This post is not sponsored by anybody. I just want you to be able to move your furniture! I see a paint coming on. I'm not much of a gadget girl, but those look pretty useful. I love gadgets. I couldn't live without the EZ Slides. I'm taking your word for it and buying these things...I need that lifter right away. Thanks for sharing the info with us! DL managed to get an industrial dolly at one of the manufacturing auctions. I'm so glad we have that sucker, 'cause all I need to do is guide instead of lift. That lifting stuff'll kill you. Funny! I have several dollies because I am usually moving things by myself so I just slide it out of the back of my SUV onto a dolly. wow! those certainly look useful! I better be done moving big furniture .....for a while! Do you have something that goes down stairs? Or something that will lift it into your truck? Seriously...I need these things!